The Blackstar ID:Core Stereo 40 V2 Guitar Combo Amplifier is a powerful gigging, recording and practise partner that is highly adaptable and sounds sublime. In addition to the award-winning features taken from the original ID:Core series, the V2 range boasts 6 enhanced voices to choose from, an Envelope filter effect, Chorus/Flange effect, and free PreSonus Studio One Prime Blackstar Edition recording software to get you tracking and recording your licks and riffs with ease. The ID:Core Stereo 40 V2 boasts a generous 40 Watt output (2 x 20 Watts) shared between a pair of 6.5-inch speakers. As we've come to expect from the team at Blackstar, this little beauty packs a mightier punch than its diminuitive size may imply. Perfect for those who are looking for a flexible practise amp, the high-power speakers are perfect for generating a powerful output for honing your chops. There are 6 selectable voices that range from ultra-clean to extremely overdriven. Whether it’s warm cleans, tight brightness, crunchy gain, or revved up overdrive you're after, you can easily tailor your tone to meet your musical demands. The Gain pot is on hand to drive your output to a heavenly aggressive result, perfect for those slab like riffs and searing lead licks. Thanks to Blackstar's patented Super Wide Stereo technology, the ID:Core Stereo 40 V2 guarantees an immersive playing experience. Blackstar's ISF control works allows you to smoothly transition between a vintage "British" response with depth and warmth, to a modern day "American" sound with a tight low end response and rampant midrange energy. At your disposal are 12 vintage-style built-in FX that cover Modulation, Delay and Reverb. Each one is specially voiced to accentuate the timbre of your guitar, making the most of the Super Wide technology. The V2 model is equipped with the new Envelope filter effect that was originally introduced as part of the ground-breaking ID:CORE BEAM amplifier. Not only that, but there is also a new Chorus/Flanger effect that blends seamlessly from lush chorus through to a swirling flange effect to add depth and texture to your tone. The Blackstar ID:Core Stereo 40 V2 is equipped with a standard 1/4" instrument input, alongside an MP3/Line input that allows you to connect an external audio device to playback for your favourite songs to listen or jam along to. 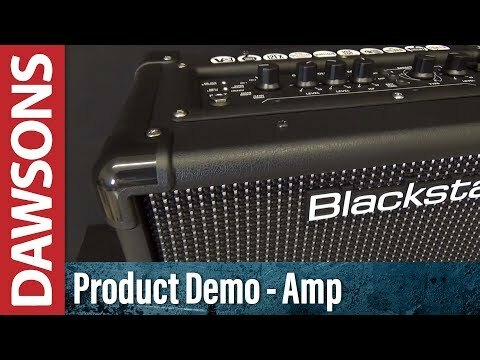 For practice or recording, Blackstar has included a speaker emulated line out so that you can be sure that what you hear through your DAW monitor output, is a faithful translation of the amp signal. Finally, a USB connection allows professional grade recording and use with Blackstar’s Insider software. Another trick up the ID:Core Stereo 40 V2's sleeve is its compatibility with Blackstar’s Insider software, which can be downloaded for free from the Blackstar website. The simple and intuitive interface lets you create, edit and store patches for the IDC series amps, store a library of patches on your computer, and share them with the online community. In addition to giving you visual control over the ID:Core, Insider is full of handy features to help you improve your playing, such as a built-in audio player for jamming along with your favourite MP3s and a 'phrase trainer' that lets you loop and time-stretch passages so you can slow sections of a song down to get it perfect. Blackstar has teamed up with PreSonus to create the Studio One Prime Blackstar Edition software, and each ID:Core Stereo 40 V2 offers the chance to download this easy to use professional quality Digital Audio Workstation (DAW). Simply use the registration code in the box and get laying down your ideas. The Blackstar ID:Core Stereo 40 V2 Guitar Combo Amplifier offers everything you need to practise and record at home or on the road in a compact, durable, lightweight design. Posted on 27/12/2016 by Jono Just had mine 3 days and it's perfect in every way: great tones; great software, which integrates well with my DAW ( Logic Pro X). The online community is really good and works well.